For a movie well known because of its showdown between armies this soundtrack is mostly beautiful tracks with a full sound. 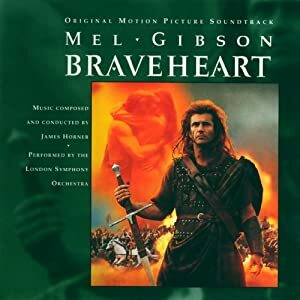 A nice mix between traditional ochestra and bagpipes to give a scottish feel to a romantic album.There are a few tracks which I would call hard to manage because they have too many changes or the change is too drastic. “Falkirk” builds slowly up to battle feel, but wouldn’t be good for background music on repeat during the battle itself. “Mornay’s Dream” starts off a little dark and immediately puts the listener in anticipation. Suddenly there is action. It is a short track, but probbaly the best action track on the album. “The Legend Spreads” might be good theme music for a village. The tracks I find hard to manage are: Wallace courts Murron, Revenge, The Ballad of Stirling, and Betrayal and Desolation.